Join me for this fun Scrapsrific Rainbow Blanket crochet along! There is no official sign up – you are more than welcome to join the Creative Crochet Workshop Facebook Group or Ravelry Group for sharing your progress or asking questions! You set your pace and work on your own time! Love & Favorite On Ravelry! 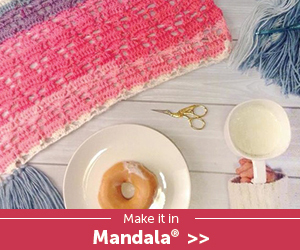 Get the parts separately FOR FREE or purchase the PDF version after the crochet along! I am using all my bits and pieces leftover from my Moya Cotton yarn! Tension is NOT necessary for this project to be perfect – same type of yarn and hook throughout the project is recommended. This post contains affiliate links. I may receive a small commission (at not extra cost to you) if you make a purchase after clicking on an affiliate link. Thank you so much for your support! Get 100% Cotton Yarns at Love Crochet! Get 100% DK Yarns at Love Crochet! Get Cotton Yarns at Wool Warehouse! Easy to Intermediate – stitches will range from easy to slightly more advanced. Strips of a variety of crochet stitches.